I left at 5.30 in the morning to catch the first bus towards Sukabumi. As I left Leo’s little paradise I felt almost a little wistful about leaving Cimaja. This place really has grown close to my heart in only this short period. But I was also excited to see more of Java. With the little ankot to Pelabuhan Ratu from there with the bus to Sukabumi. Change the bus in Sukabumi and go to Bandung, from there one more change and off to Pangandaran. I had about a 12 hour journey in front of me. In Pelabuhan Ratu was my bus already waiting and it also left right away once I was on the bus. Strange, I thought, since when do these buses actually leave on time!? I said to my self, it must be the early hour. I was still very tired and felt safe enough to fall asleep in the bus. I read and heard everywhere that if you travel alone you shouldn’t sleep on the bus because your stuff will be gone. Also, my friend Walet told me the story that on this particular way people try to sell you rings in the bus and if you put it on your finger you will be falling asleep. Once you wake up all your stuff will be gone. I even saw the rings so I can assure that it isn’t a fake story. Never the less, I didn’t have any problems so far and I always fall asleep in these buses. Since the roads are so bad and it is extremely bumpy and wiggles you around like a baby in a crib. Just not as soft. But for me it works like a charm. We arrived in Sukabumi and again there was my next Bus waiting for me and again left within the next five minutes. This time I wasn’t as comfortable as before. The bus was so full that people had to stand. I was sitting with one buttcheek on the seat and with the other one in the air, because I squished my backpack on the same seat. I didn’t think that I was going to sit like this for the next 3 hours but I actually had to. The bus stopped and a young woman came on and sat next to me. She looked like she was fifteen years old but as we started to talk later on, it turned out she is twenty. She also, like many others, works in a bigger city during the week and then goes back home on the weekends. Her mother was with her, and for almost everything she wanted, like for example food in the bus, she asked for permission. It made me think how I was with twenty or how the twenty something ones are in London. I don’t think any of them are asking for permission anymore. We were getting closer to Bandung and I was expecting a huge city. As I was looking out the window and realised due to the traffic that we must be in the city, I couldn’t see that “huge” city that I was expecting. Shortly after we already stopped at the bus station and I realised I never really made it in the centre. I got out of the bus and stood in the middle of all these buses of which most of them were about to drive of. Everything around me was moving and I had trouble finding the name Pangandaran on any of the buses. After walking in a circle and asking people who seemed to keep pointing towards all the buses I decided to stand in the middle of the square and shout loud “Pangandaran”. A man in a bus on the left hand side already on the move, shouted back: “Here Miss, here Miss – Going to Pangandaran! !” I ran after the bus and while I was running I kept asking if he is going to Pangandaran. His answer was rather wage but I had to decide in a split second and jumped on the bus. Once on the bus I realised that I was in an economic bus. Packed and full of men who were staring at me I tried to find a free seat. No luck! I had to stand for three hours straight and I definitely reached the moment where I left my comfort zone. Judged and stared at, I couldn’t help but think that every single person in this bus was thinking: “Ah god another traveler! Another Backpacker!” I tried to smile my way in to their approval but never ever did it take me so long. I had to change bus again and finally I was on the one to Pangandaran. After twelve hours of travel, I finally arrived in Pangandaran and made my way to find a hostel. A little guesthouse more or less right at the beach run by Tika, a lovely local lady. It is a cute little guesthouse that is very simple but has a lot of charm and so far the best banana pancakes I had in my life! 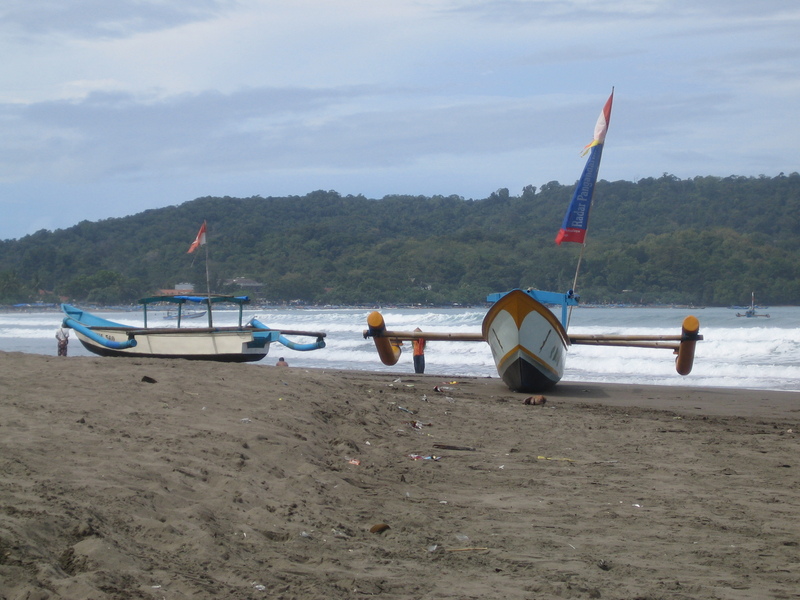 Pangandaran is a village that has become a holiday resort for locals from Bandung or Jakarta. You can tell when walking through the village that tourism has taken over. Unlike Cimaja it is not rural anymore and the moment you arrive and step out of the bus you will be asked by plenty of men on their motorbikes if you need a ride. I was in the mood for walking after twelve hours of sitting on my bum, and it was quite a task to full fill, believe me! The beach is a beautiful sand beach with great waves i the morning. If you get up early enough you will have the perfect break. After twelve noon it will be flat and you will have to wait till around five and if you are lucky you can have a late surf again. There are a lot of locals who have surf shops a long the beach and so I was fortunate to get again tips after tips. I had an amazing time with them and all I wanted to do was to get better. The feeling I had ever since the first moment I started surfing got stronger and stronger. There is only one place I can turn of my brain (which is kind of hard for me), be in the moment and feel that I am alive. I have absolutely no sorrows once I am in the water. There is something about Pangandaran that is capturing even though it is not as beautiful as Cimaja in my opinion. You can take day trips to the green canyon and green valley. Or you can go to paradise island and see amazing animals and a beautiful white beach. But right here is the thing about Pangandaran. All those places lose their appeal, in my opinion, because all the local tour guides ruin them with their trips. It is all about money! Of course I understand that this is the way they are making their living but it is also them who don’t take care of their own land. The amount of trash that they are throwing on the ground is shocking! I wanted to go by my self but it is not so easy to do, because faster than you can blink you have one of them on your side and they wont leave till you paid them. I still went for one trip and decided I wanted to go see the waterfalls in green valley. I expected a hike and huge waterfalls, but as we got there the way was plastered with stones so that every one, no matter how out of shape, will eventually get there. When I wanted to walk to the second waterfall a bit further away, it was more of a hike and my tour guide was the one who was out of breath. Even though I was a bit disappointed, it was still very beautiful and worth my trip! One thing that impressed me in Pangandaran was how much the locals love their village. 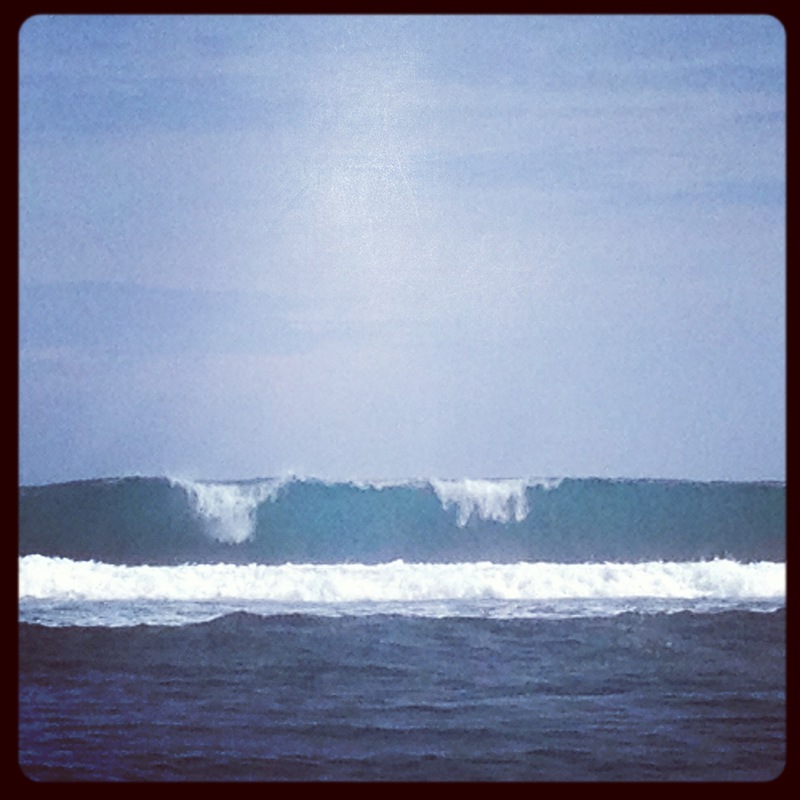 The ones I met and surfed with all worked in Bali for sometime or still do. But all of them every single one, said they want to come back and live here in Pangadaran. For them it is the best place to be. All my live it impresses me when I meet people who love their home town so much that no matter where they go in the world, they know they will eventually come back home. I never had that feeling to the place I spent my childhood. It was beautiful for sure, but I know for a fact that I will never go back there. On the other hand I have learned that home can also be in one self. If you are happy and content with yourself and you know who you are, you are basically home everywhere you go. Nevertheless, I think we all search for that place and person that we can call home. For some it is where they grew up for some it is a new place and for some it is a person. More importantly it is the ride that counts and that makes us appreciate “home”. Without the ride we wouldn’t know what we miss, love or want. The stories of those guys reminded me on my ride and how grateful I am for being able to do this. Little by little I know more what it is I want for my home! I spent a memorable time there. Meet amazing people, learned a lot about my self and surfed for the first time a 6ft short bord.